Instant Tethering Automatically Turns On Your WiFi Hotspot! Ok, let’s be honest now. As useful as this process may seem, it has always been a pain to setup and configure our password and allowing other devices to connect with us. Also, it might be frustrating to open your settings and fiddle up with the hotspot function everytime you lose connectivity or when you are in a place with no WiFi. 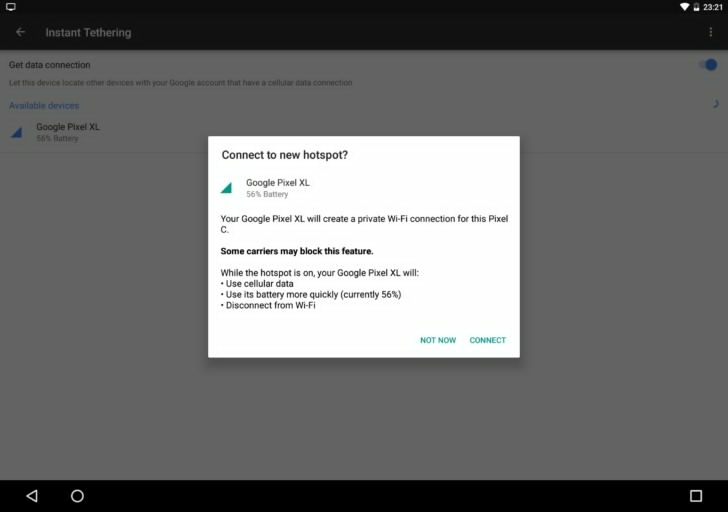 Enters Google’s Much needed Instant Tethering feature which is rolling out to all android devices with the latest update version 10.2 of Google Play Services. With this feature, you may never have to actually touch your phone or struggle with all of your devices to turn on the hotspot and connect each one of your devices. Because, this time, Google takes care of it all. Yes, all of you have to do is to ensure that all of your devices are connected to a common Google account and the rest of the things are taken care of Google. Once your device connected to a Google account loses connectivity or moves out of a Wifi Region, it is immediately switched to the mobile network and all of your devices that are connected to your Google Account will be automatically connected to this network. You just have to provide the permission once and then the process is seamlessly handled. Google even provides you specific information about the device name you are about to connect, the battery level of the device and warns you that your battery may quickly drain while you are connected to the hotspot. That is pretty impressive right. The update is currently rolling out to the Pixel and the Pixel XL and to the Pixel C tablets and is expected to roll out to other android devices soon, So, wait for the update to reach you and you may never have to worry about losing connectivity or missing out on your important notifications or emails anymore. Because Google is there and it will take care of it for you!